Under article 22 of the contract, you are entitled to file grievances. I went over twenty years without doing so, but then I became chapter leader. Since then, not only have I filed more grievances than anyone else in the building, but I've also helped a whole lot of other people to do so. A lot of my members ask me what filing a grievance means. In case you're wondering too, I'll tell you. The first step, conveniently labeled Step One, is when you bring your issue to the principal. You or your chapter leader will make a case for your grievance. Then, the principal will rule. Depending on who your principal is, your chance to prevail here is limited. Some principals may perceive error. Others may feel they know everything and are absolutely never wrong. In case it's the latter, you're pretty sure to lose at this step. Should the principal decide that two plus two does not, in fact, equal four, your journey has just begun. Once the principal denies your Step One, if he or she even deigns to bother, what with rules being for the little people and all, your grievance then goes to the borough office. (If you get no ruling, you can file yet another grievance under Article 22 for failure to rule, which is the principal's job. )There is some sort of grievance committee there. They will decide whether or not to bring your grievance to Step Two. Step Two means you, and possibly your chapter leader, are gonna spend a day in lovely downtown Manhattan. You'll go there, and face a hearing officer who represents the DOE. There will be a DOE lawyer there, likely from the ethics-shmethics org that calls itself "legal." They will make outlandish, perhaps improvised, arguments about why your principal doesn't need to follow the Collective Bargaining Agreement in this case. The hearing officer will listen. Alas, your chances of prevailing here are not so good. I'm gonna go out on a limb and assume the person working for the DOE was not selected for relentless opposition of DOE positions. And so it goes. …an incident which has not been reduced to writing within three months of its occurrence, exclusive of the summer vacation period, may not later be added to the file. It's pretty clear to me, but over at "legal" it's a complete mystery. What could it possibly mean? Maybe we should assemble a team of lawyers to figure it out. Regular UFT members might think maybe if you're accused of tossing a cheeseburger at someone ten weeks ago, it means the principal can't put a letter in your file today over it. On the other hand, "legal" could contend they need a team of lawyers go to work and examine what the word "the" means. After all, that's why they exist! Step Three is with an arbitrator, who hopefully has reached the lofty state of awareness I refer to as Not Insane. That's where your Step Two goes if the DOE person rules, you know, for the people who give him his paycheck. The great minds over at "legal" fought the good fight to have special ed. teachers work SESIS on their own time for nothing. Though the city ruled in its own favor, this eventually cost millions of dollars in losses to affected teachers. Arbitrators deemed us not to be indentured servants after all. I'm not sure whether the UFT reps cited Article 20, Matters Not Covered, and then used the 13th Amendment of the Constitution, but I would have. 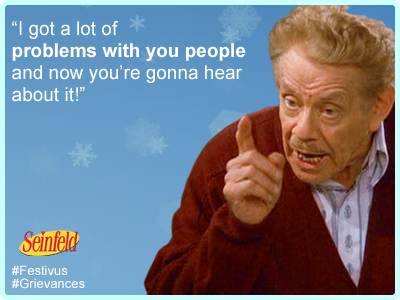 Grievances are a vital tool. No one should treat working UFT members with the contempt and disrespect that "legal" makes its stock in trade. With all my reservations about leadership, I absolutely vote union when Janus comes. Just one decision from the purposefully illiterate jugglers at "legal" could cost you what would've been your dues, the dues of your brothers and sisters, and more. We need to work toward making our union better, as opposed to a fond memory.